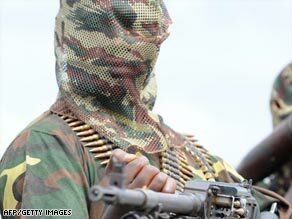 LAGOS, Nigeria (CNN) -- A Nigerian militant group tangling with government forces in the country's southern oil-producing region declared "an all-out war" Friday after what it said was a deadly bombing raid on civilians. Militants from the Movement for the Emancipation of the Niger Delta have declared war on Nigerian troops. The military, meanwhile, pressed ahead against the fighters, wresting control of a hijacked tanker and capturing a militant stronghold. In e-mail messages to reporters, the militant group said it sank six army gunboats, destroyed three others and captured three in the restive Niger Delta region. "Many soldiers have been killed, and the military has made a hasty retreat," said the group, which is calling on "men of fighting age to enlist" in its battle against government forces. Also, the group said, it had captured personnel from a Nigerian warship deployed from Liberia to help the military and was "in the process" of torching the vessel. "We have some casualties on our side, obviously," a militant spokesman said. "Obviously, the battle is more serious as night comes." Col. Rabe Abubakar, spokesman for the Nigerian military's joint task force, confirmed exchanges of fire between government forces and militants and reported the seizure of a militant camp, saying one soldier was wounded and the militants "suffered a lot of casualties." The troops are conducting cordon-and-search operations designed to nab militants in their suspected hideouts along the southern region's creeks. Abubakar said that the military conducted a successful "rescue" mission of a recently hijacked oil condensate tanker, and that the captain and the crew, some foreign, were safe. The militant group said Nigerian troops fired stray bullets that killed a Filipino "hostage" on the ship in Delta state, but the Nigerian military couldn't confirm the killing of a "foreign hostage." The violence, which has included attacks on pipelines and hostage-taking, has limited shipment of crude oil supplies out of Nigeria. It also repeated its "directive" for oil companies in the region to "evacuate by the deadline of midnight today and cease oil production until further notice." The military made reference to the directive, saying it is responding to attacks on troops, hijackings of vessels and threats to innocent people, such as the "expatriates who were given ultimatum to leave the region by the militants." It characterized the various claims by the militants as "propaganda."